To begin with, welcome along to The Beatles Forum and Cavern Club ‘Trivia’ section. Here we have a large selection of Beatles trivia and quizzes for everyone with an interest in the Fab Four. Every Beatles game has 20 multi-choice questions with 4 possible answers. So all you need to do is select the correct answer from those provided. Furthermore, all correct answers will gain you 5 points. With this in mind, there are 100 points to play for. Once you complete each individual Beatles game, you can then share the result with your friends on social media etc. Obviously, you can compare your results this way and see who has better knowledge on the Fab Four. We also check all our questions and answers so that there are no mistakes. However, should you think that something is wrong with any of the quizzes, please let us know. In short, each Beatles game in the mixture section follows the same format. Indeed, in this mixed section, there are 3 separate Beatles quizzes. 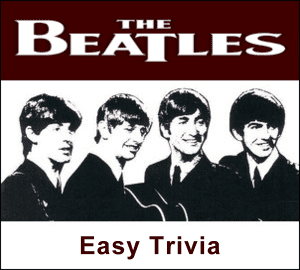 Firstly in this section, there is the easy Beatles trivia. Secondly, there is the harder questions. Thirdly, there is a difficult (hardest) Beatles trivia. Obviously every Beatles Lyrics game only has questions about Beatles’ songs. Of course we have an easy Beatles Lyrics quiz and a hard one too. But we also have a game called Finish The Lyrics. In this game, we provide a line or two from a Beatles’ song, then all you need to do is finish it off. As well as the normal quizzes above, we also have Beatles Image Quiz. Obviously we have 20 questions about The Beatles but all involve an image with some connection to the Fab Four. Some of the images may be easy but some will have you thinking hard. This is because some of the images are only portions of a much bigger image. Of course, Beatlemaniacs should get 100%. However, by carefully studying the images, we think that most people will get a reasonably high score. In the Beatles’ song titles quiz, we show the title of their songs but with a word or two missing. So, all you need to do is fill in the missing word to complete the title of the song. Some are very easy, but some are difficult. However, a Beatlesmaniac will know them all, won’t they? Be that as it may, everyone with an interest in The Beatles should have a go. All Beatles’ song titles are available on their albums or as a single, of course! So, there’s no trickery involved. So, you think you are a Beatles expert, Beatlemaniac or just an admirer of the Fab Four? Well, try our Beatles quizzes and trivia today and see how you get on. Indeed, you may surprise yourself how much knowledge you really have on the moptops. But remember to share your results on Facebook etc. Finally, why not join the main Beatles Forum and show off your score there too. However, while you are there, join in with other like-minded people and have your say on anything under the sun.